- Forestry and Forest Products Research Institute. REDD Research and Development Center. The Warsaw Framework for REDD-plus was adopted at the 19th Conference of the Parties (COP19) to the United Nations Framework Convention on Climate Change (UNFCCC). At COP21 in 2015, the Parties agreed on the issues brought forth from the previous conference, and the main technical discussion on REDD-plus was completed. 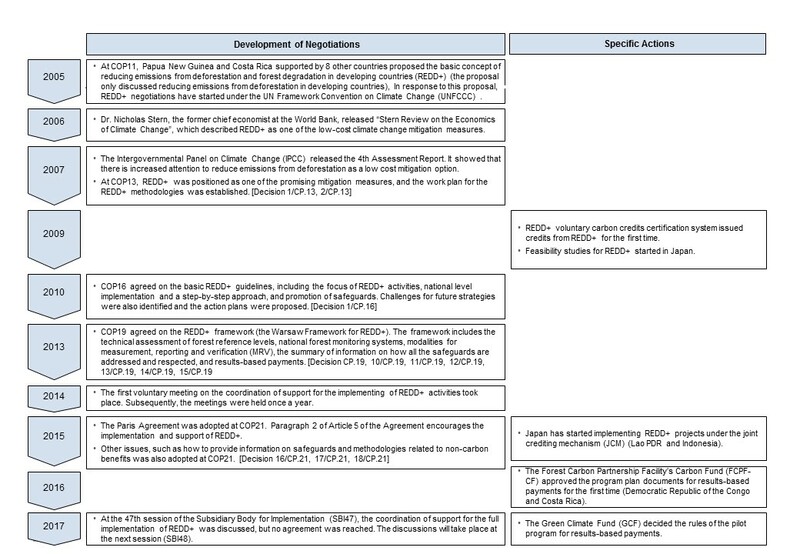 Currently, REDD-plus negotiations are being continued in relation to the coordination of support, and the implementation rules for the Paris Agreement (climate change mitigation, transparency, and market mechanisms). On the other hand, with the completion of the technical discussion, each country has started developing specific strategies to implement REDD-plus, and active discussions related to REDD-plus finance are being held at international and national levels. For example, the Forest Carbon Partnership Facility's Carbon Fund (FCPF-CF) has been negotiated with developing countries on the price of results-based payments, and on how to address the total amount of CO2 emissions reductions in the Nationally Determined Contributions (NDC). Also, the Green Climate Fund (GCF) established guidelines for the pilot program related to results-based payments. Discussions held by the FCPF and GCF, which offer large-scale funds, will highly likely affect the future direction of REDD-plus, and they must be closely watched.